Finally an employee intranet software that connects distributed teams and transforms how they communicate. 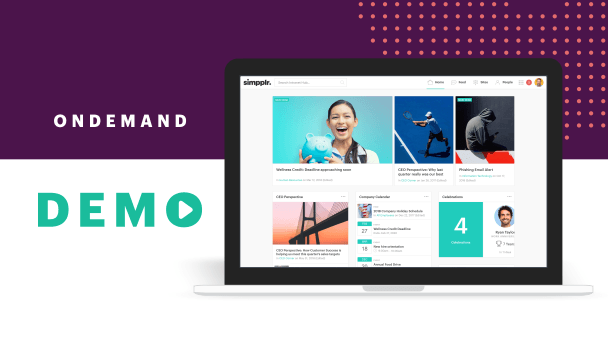 Simpplr's intranet software helps connect and engage employees to boost productivity, increase retention, and drive engagement. As the workforce is becoming more distributed, a corporate intranet’s primary goal should be to connect coworkers. Simpplr is purpose built to develop networks across departments and locations. Quickly and easily connect with the right people through an employee directory that makes collaborating with coworkers easy. Help people get to know each other, drive engagement, and improve morale. Profiles include biographies, areas of expertise, activities, and social connections. Engage employees with contemporary social intranet features: share, like and respond to content; follow favorite users; socially tag content; engage users with polls and surveys. Follow and favorite coworkers to stay on top of posts, blogs, updates, and celebrations within a social intranet software that connects teams across the organization. Bring your company culture to life by adding photo or video content. Just drag-and-drop to add and organize all of the important moments. 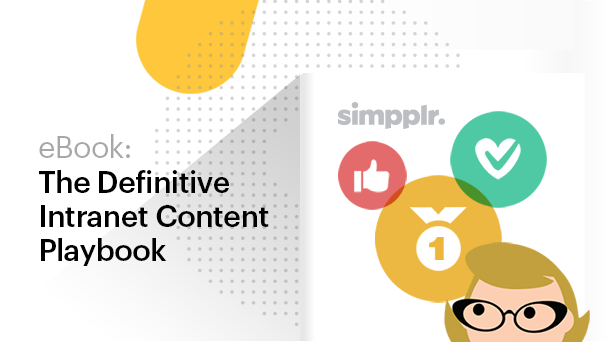 Help everyone in your organization become a social marketer with workflows that make it easy to share approved social content. Allow employees to share ideas and experiences. Executives, influencers, and rising stars now have an easy way to communicate across the company within Simpplr's intranet. Employees are buried in information, and it’s hard to keep everyone on the same page. Simpplr's corporate intranet software will help clarify important news, focus employees on what matters, and reinforce company values. Keep your team informed about important announcements with the carousel right on the company’s intranet homepage. Keep your on-the-go employees connected with fully featured Android and iOS apps and mobile-optimized web access. Socialize your upcoming events to encourage participation and feedback. Publish event details, including timing, location maps, organizers, RSVPs, and attendees. Keep everyone current on critical projects, files, topics, and activities. Social intranet activity feeds allow teams to work together easily and finish tasks faster. Keep your team abreast of important news and actions by easily providing alerts and notifications right on their corporate intranet dashboards. Ensure that important company updates within the corporate intranet are read by your employees. Each employee is alerted and must acknowledge reading the article. Keep employee engagement high and communications aligned with scheduled digests and ad hoc newsletters that can be created in minutes within your intranet. Help department and team managers communicate news, milestones, survey results, customer testimonials, and more. Employees waste a lot of time simply looking for information. Simpplr's intranet software will help employees get to the information they need so they stop getting stuck. Put everything at people’s fingertips. The intelligent search built into the intranet’s desktop and mobile apps provides quick access to people, files, sites, and more—from anywhere, at any time. Keep your most important enterprise apps at your employees’ fingertips. If you use an SSO provider, all of your connected apps will automatically appear. Easily create content-rich social workspaces for teams, departments, and communities within the intranet. Choose the features and customize the look of each site—no tech skills required. Add to your knowledge base using preformatted web pages that can be created by any business user. All pages are easily organized and fully searchable, and employees can subscribe to whatever is important to them. Access and share files of all types securely and easily. Integration with SharePoint, Office 365, Box, Google Drive, and other file-sharing services is built in. Versioning and permissions are a snap. Search is, too. 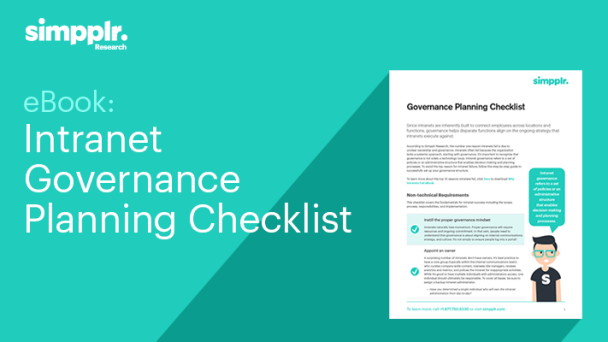 Many intranets fail because they’re hard to setup and maintain. Simpplr was built to easily deploy, administer, and monitor so the intranet (and those managing it) can be successful. Understand who is using your company's intranet, how it's being used, and where adoption can be improved. Always know what content is and isn’t working on your intranet platform. The analytics dashboard gives you instant insights you can act on. Lighten the burden on IT and distribute site ownership across the organization with a point-and-click configuration that requires zero coding skills. Personalize every employee’s experience based on role, location, and domain. Allow your employees to customize and organize their experiences based on their interests. Follow topics, sites, and people with the click of a button. Manage roles and user permissions effortlessly to define what actions your site managers and employees can take based on your policies and governance. Keep the employee experience on brand. With just a few clicks, Simpplr’s corporate intranet lets you customize colors, fonts, logos, and more to bring your community to life. Sync with your active directory/LDAP or Workday HRIS to automatically provision and deactivate users. Avoid making your corporate intranet a file dumping ground with the ability to automatically sunset content after a given time. Prevent mistakes with built-in content management and publication workflows, and ensure that only approved content is published. Connect your digital workplace with real, meaningful integrations. Simpplr’s intranet software comes preintegrated with Salesforce, Office 365, Workday, Box, Vimeo, YouTube, Vidyard, and other major apps. Integrate with industry-standard identity and access management platforms including Okta, OneLogin, Salesforce Identity, and Active Directory. Employees get one-click access to company apps right from their personal homepages.